Pressure Sand Filter is the perfect solution for the removal of impurities that may be suspended or visible. It can be designed for industrial applications and widely appreciated for the reliable performance and efficiency. With advanced media filtration technology, Pressure Sand Filters provides effortless filtration to produce clear water in any type of system. Karyasiddhi offers a wide assortment of Pressure Filters and efficiently filter water and remove turbidity, suspended particles, color, odor and iron that are present in the water with minimum pressure drop. 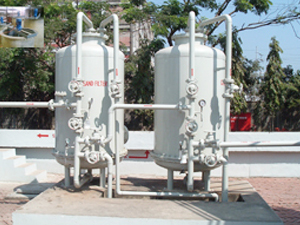 The entire range of water treatment systems can also be customized as per the specification detailed by the clients. We offer easy to operate pressure sand filters that give sparking clear water. The filters which are commonly used are sand and gravels or anthracite, carbon and magnetized dioxide.